Cottage in La Bazoque, Nr. Bayeux, Calvados, Normandy, France - Private Garden & Parking Area, Good Facilities, Free Wifi Internet. Set in peaceful, beautiful surroundings beside an old mill, this former bake house overlooks a tranquil wooded valley, waterfall and millstream. Restored by the English owners who live next door, it is the perfect spot to relax and unwind. Situated not far from the town of Balleroy which has two bars, a supermarket and two boulangeries where you can buy bread, croissants and mouth-watering cakes. In the surrounding countryside are pretty villages, forests, a lakeside leisure centre and wonderful opportunities for walking or cycling, starting on your own doorstep. The area around the cottage is a haven for wildlife, and visitors have reported seeing deer, hares, foxes and kingfishers to name but a few. Egrets, and for the last four years black storks, are occasional visitors. The cottage is set on a slope overlooking a valley and has accommodation on three floors. On the main floor is the living/dining room, with views of the valley and waterfall. Hi I'm Stephen - I've lived & worked in France for the last 25 years. I'm an agent commercial (property agent) which is quite different from my former career in the UK. I've been self employed here since 1995 & my work has taken me around some beautiful parts of this region. Still much to explore and never get tired of it. We first came to Normandy over twenty years ago to visit a friend, with no intention of buying a house. We went back owning a watermill. Well, not quite, but we'd put in an offer. The sale went through and a few years later we moved here permanently and began the massive task of renovation. We love the isolation here and the absence of noisy neighbours, which is what first drew us to it. The surrounding woodland and meadows never cease to surprise us with the abundance of wildlife. The town shops are only a few minutes away, the ferry ports less than an hour, so we're not exactly cut-off from civilisation. It's a great central location here, Bayeux is only a 30 minute drive, the tapestry and Cathedral are a must. The lovely beaches are about 45 minutes which are great for family relaxing or to do the historic and moving tours of the D-day landing sites. The world famous Mont St Michel is about and hour and a half west of here. If you want to visit Paris for the day, the trains go from Bayeux and only take 2 hours each way. This cottage can offer peace & quiet for relaxing on-site, you only have ourselves & the wildlife for neighbours. The views up & down the valley from the cottage are unique. Towels are provided if bedlinen is hired. All kitchen cloths and tea towels are provided as standard. At Port-en-Bessin is the renowned golf course at Omaha beach (40 minutes). It has two 18 hole courses, the 'seaside' and the 'manoir' courses. Lessons are available, regular competitions and tournaments. • Because of the nature of the site and the fairly-steep stairs, the cottage is unsuitable for disabled persons or those with reduced mobility. Notes on accommodation: For practical reasons, we cannot accept dogs or pets. We do not allow smoking in the cottage. There is unfenced water nearby. Outside: The private fenced garden has a small area of lawn and a terrace (approached by steps) with garden furniture and a barbecue. There is a private parking area a few yards from the cottage. Utility Room: Automatic washing machine Cleaning / Towels / Linen: Each bed has a duvet & 2 pillows per person, all non-feather. Bedlinen (100% cotton) & towels are included, beds will be made up for when you arrive. Beach towels not included. The house exceeded our high expectations! It is charming, comfortable, & the location is very peaceful. The kitchen is well equipped, the beds are comfortable, & the bathroom well appointed. In addition, the owner, Stephen, was very helpful and welcoming. We thoroughly enjoyed our stay & hope to return soon! Fantastic rural setting. Beautiful countryside, and not far from local amenities. Loved it! We had a two week stay in this beautiful cottage. It was in a great location; close to local market towns and not too far from the lovely Normandy beaches. You truly feel like you are 'away from it all' as the cottage is situated in such a peaceful, natural setting. The cottage contained all the necessities you need on holiday and Stephen and Caroline were very helpful with all of our queries. We would love to return and would recommend it as a great place to stay. The gite was easy to find. Stephens directions were very helpful. The gite itself was absolutely spotless and clean! It was set out well with all the amenities we needed. It's setting was lovely, and we walked a little route one day through the wood, and back through the village of La Bazoque. The location was brilliant and is only a short drive from Bayeux and the D-Day landing beaches. We also went to St Malo and Mont St Michel one day, which was about an hour and a half drive away, but well worth it! The only improvement I think that could be made would be more comfortable seating, both outside in the garden and inside in the living room. Highly recommended though, and we had a brilliant time!! The cottage has everything that you need (seriously everything), comfortable and homely. The Normandy region is beautiful, the cottage is ideally situated for all the major sites: the beaches, the castles, the abbeys, the towns - do it all, don't stop! There are an abundance of local restaurants with lunchtime set menus (12-15 euro), I was not disappointed with any of them. I stayed here for a week, mixed weather, but we are British and we love to talk about mixed weather. One day I was on factor 30 the next day it was a waterproof - but who cares in the lush setting of Normandy. Our boys 70 years ago did not get the choice - thanks to them, we can travel freely around with our European friends and neighbours. It was lovely to come back to the cottage every night, which I would like to say, I slept solid for the week, ready and refreshed for work tomorrow. The gite was beautiful, spotlessly clean and extremely well equipped. We wanted to explore Cerisy Forest, Bayeux and also the D-Day beaches. The gite was in an excellent position to do all of these things, very good road links. It was also very rural which we enjoy. The gite was spotlessly clean and very well equipped. It had a beautiful woodburner with free wood which was a bonus, it was lovely to have a fire in the evenings. The nearest bakery was in Balleroy, lovely sandwiches handmade by the owner, there was a small supermarket too. Further afield Bayeux had everything you needed including a large supermarket, shops, restaurants and cafes. We had a wonderfully relaxing time. 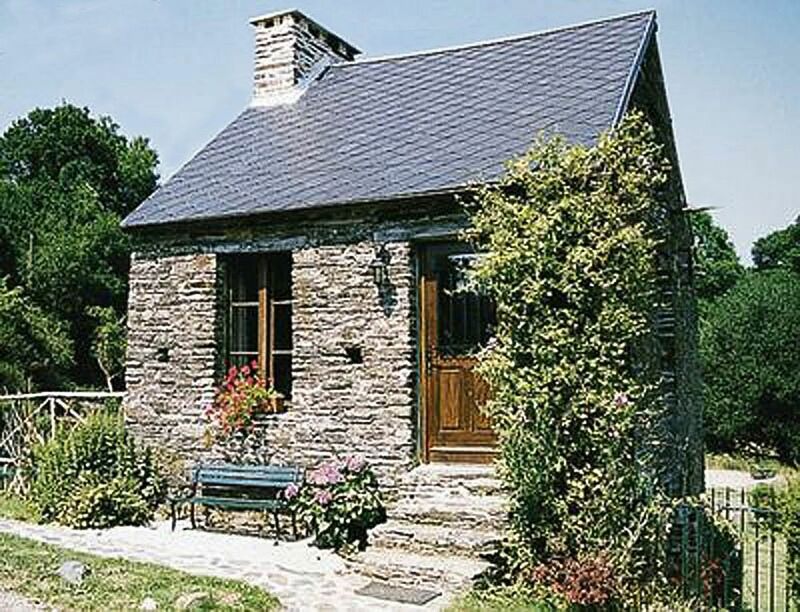 I would recommend this gite. The D-day landing beaches as well as being of historic interest are also a great & safe family venue. 40 minutes drive to the east of the cottage takes you to Omaha beach including the pretty fishing village of Port-en-Bessin with its Sunday market. All along this coastline are miles of sandy beaches to explore, a great family day out. The port of Caen (Ouistreham) is a 45 minute drive, with regular crossings from Portsmouth. Calais is a 4-5 hour drive. The airport of Caen (Carpiquet) is 40 minutes by car. The train station at Bayeux is 30 minutes, trains take 2 hours direct to Paris St Lazare. Booking Notes: Changeover Day: Changeover day is always a Saturday - departure of guests before 10am and arrival of new guests at 4pm or later to allow cleaning and bed changing. Notes on prices: We do not offer a weekend or daily tariff ~ Bedlinen & towel hire is normally included in the price, please see for details, maximum £40 ~ A basic allocation of electricity is included. If exceeded during cold weather for heating, a charge may be made up to a maximum of 50 Euros per week. ~ Firewood is included in the price, as is Gas for cooking.